... In this case, me, and the Historical Fiction Smackdown (HFSD) entry I'm currently battling with. In case anyone is unsure what the Historical Fiction Smackdown is, it's where a bunch of contestants follow set rules for their historical fiction stories and a panel of judges eliminates them round by round. Round 1 was the Regency/Victorian Round. They broke us in gently with a choice. Once we chose our era, we picked three pictures from an era-specific list. Those pictures had to feature as scenes in our story (3,000-5,000 words). We were also divided into groups and each group was given an object which we had to make the centrepiece of the story. I was in group 4 and got an ivory pipe. I also chose three of the Victorian pictures to focus the action on - The Oxford Arms, two Victorian ladies in a garden, and a girl lying ill on a couch with her family attending her. I wrote a story I've called Wreaths of Smoke but may change the name to My Cruel Mistress. Have a read and see what you think! I tried to write it in the style of a nineteenth century story, and took inspiration from Thomas de Quincey's Confessions of an English Opium Eater, his own autobiographical tale serialised in the“London Magazine”, September 1821. There was a bit of Poe and Wilkie Collins in there too, and a splash of Dickens. I read The Mystery of Edwin Drood and fell in love again with John Jasper - I hope I captured a bit of that self-loathing downward spiral in this story! Thank goodness for Project Gutenberg and their mobile app. Free literature - always a good thing! I was at my lowest ebb when I finally succumbed to my mistress, Necessity, and sold my father's pipe. 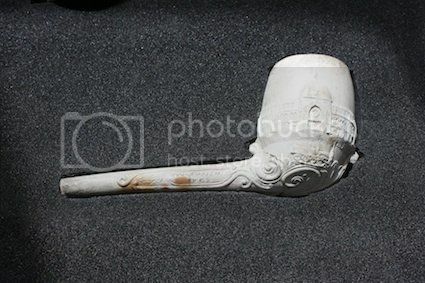 A magnificent ivory piece, worn at the stem and smooth beneath the bowl, it was truly a work of art which I would have found difficult to part with even without a strong sentimental attachment. My shame, it pains me to report, lay not in that act alone, but in its purpose. The pipe fetched a fair price, and would have fetched more if I had had the courage to deal with a reputable man of business and good taste, but I did not. It got me through to the next round, which was the Crusades. For anyone who knows that I am, by day, an academic, focusing on the Middle Ages, you'll probably think that this was right up my street. The truth is, the Crusades bore me senseless. It's a lot of politics and sand. So actually, Round 2 was pretty tough! I ended up setting the whole thing in 1221 and fictionalising part of my PhD thesis. I came up with a lord suffering from PTSD and set it around a court case I'd come across in my research. I have an academic blog which follows my medieval adventures, if anyone is interested! The story had to use three quotes from a list (from The Princess Bride, mainly), and four pictures from the list of ten. "You're afraid of what might happen, but I'm afraid of what is happening." "Life is pain. Anyone who says differently is selling something." My four pictures were of a woman on the walls of a town, a child with a sealed letter, Saladin before his forces (above) and a large stone barn. I came up with Wayward Sons and it got me through to Round 3! Sir Robert was blinded by the dust. Choking clouds of the infernal sand, hot and clogging, got between his plate and chafed his skin. The noise rang in his ears. The clamour of the Turks on the walls made his helmet ring and the heavens quiver. The hellish trumpets sounded, over and over, relentless and piercing. Damn those horns! He was no miner, thank God and the Virgin, but the sand and heat and constant bellowing was already too much. He stumbled forwards, avoiding a missile he barely registered, and saw they had the cercleia prepared. The jointed machine was being rolled into position, and the ballistii were covering with savage fire. Yet still the horns were being blown. Still the Turks were shouting. Round 3 is nowhere near my comfort zone. Literally. Round 3 is Sengoku Era Japan. 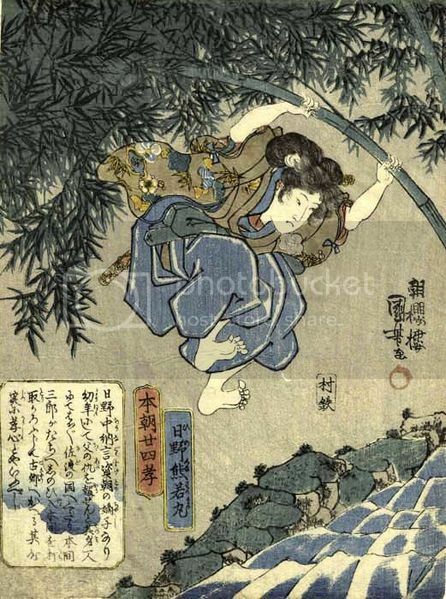 For this, we have to choose pictures - I *think* I've picked mine - from the list of Japanese art, and then choose a tanka (a form of Japanese poetry) which not only has to feature in the story but has to be the entire theme of the story. I'm currently doing some research on (a) the Sengoku era (b) Japanese customs and (c) tanka poems. I've decided to experiment and, inspired by The Tale of Genji and tanka poetry, I am busily writing my new entry. I have until May 29th. I've decided to write it partly in the usual narrative form, and partly in tanka. I used to write poetry when I was little, but not so much any more. In fact, I don't think I've written poetry since High School. Thanks to Jeanne Emrich's Quick Start Guide to Writing Tanka I played about with strict syllabic structure and free form, and came up with a few tanka of my own! In Japan, tanka is often written in one line with segments consisting of 5-7-5-7-7 sound-symbols or syllables. Some people write English tanka in five lines with 5-7-5-7-7 syllable to approximate the Japanese model. You may wish to try writing tanka in this way. But Japanese syllables are shorter than English language syllables, resulting in shorter poems even though the syllable count is the same. To approximate the Japanese model, some poets use approximately 20-22 syllables and a short-long-short-long-long structure or even just a free form structure using five lines. You may wish to experiment with all these approaches. ... It's shaping up to be a Romeo and Juliet story. Check out my facebook page to find out when it's done! >>What is the most experimental thing you have ever written? >>What is the most experimental thing you have ever read? Leave a comment and let me know what you think of my experiment! This is one fantastic post... I look forward to more. Wonderful. Good luck with the third round. I'm sure you'll get through it! I have shared this on Google + and FB. Thanks! :) I'm trying to get better at tanka, but needing to tell the story too... Maybe I'll post some more here for critique..!